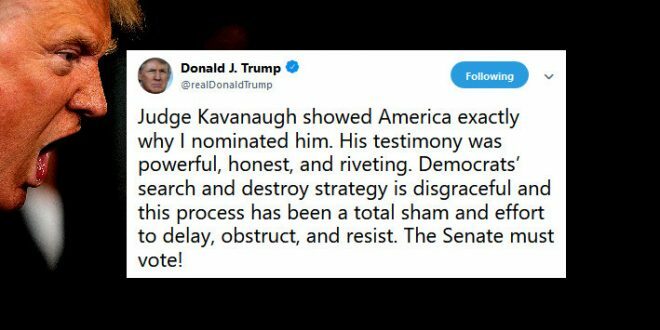 Trump Demands Senate Vote On "Honest" Kavanaugh - Joe.My.God. Moments after Brett Kavanaugh’s testimony concluded, Glorious Leader paused Fox News to shower the “powerful, honest” nominee with praise and to demand that the Senate vote on his confirmation. The Senate Judiciary Committee is scheduled to vote tomorrow morning and at this writing it seems the only possible GOP “no” vote would be Sen. Jeff Flake. But don’t hold your breath.